The U.S. Mint’s newest coin for collectors, the 2018-W $25 Proof American Palladium Eagle, goes on sale today, Sept. 6, at noon ET. U.S. Mint image of the 2018 Proof Palladium Eagle. Each coin arrives encapsulated and packaged in a gray leatherette presentation case with satin lining that is accompanied by a Certificate of Authenticity. 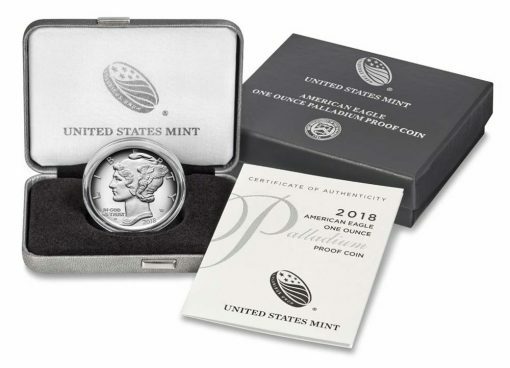 Containing 1 ounce of .9995 fine palladium and limited to 15,000 pieces, this collectible is one of the U.S. Mint’s more expensive pieces with its launching price of $1,387.50. That price can change weekly based on the trending value of palladium as compared against the Mint’s pricing matrix. The current price is based on an average of palladium that’s within $950.00 to $999.99 an ounce. 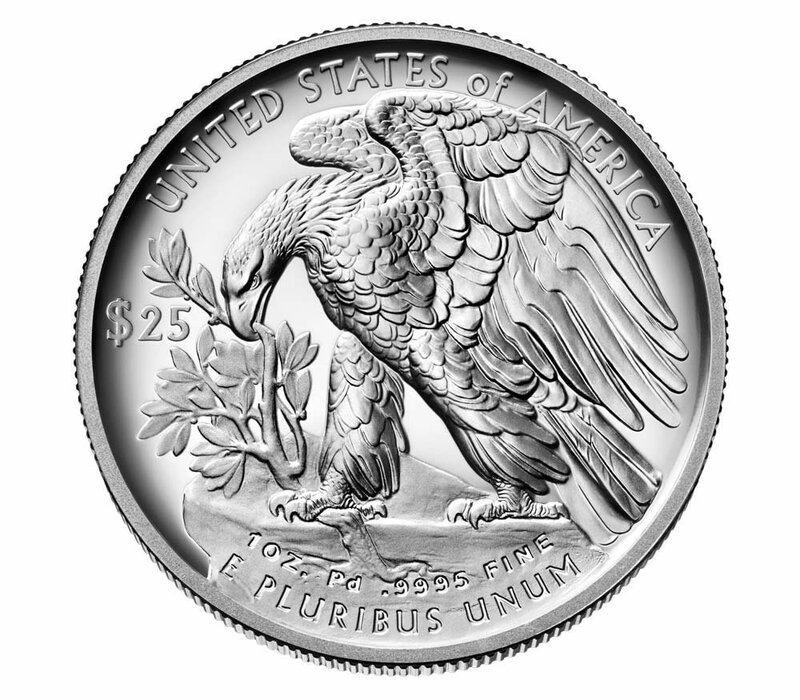 Last year, the U.S. Mint introduced its bullion American Palladium Eagle — a coin struck for investors. All 15,000 sold on their Sept. 25, 2017 release day. The collector proof coin bears the same designs as last year’s bullion edition. A CoinNews photo showing two bullion 2017 American Palladium Eagles produced for investors. At left is the obverse and at right is the reverse. 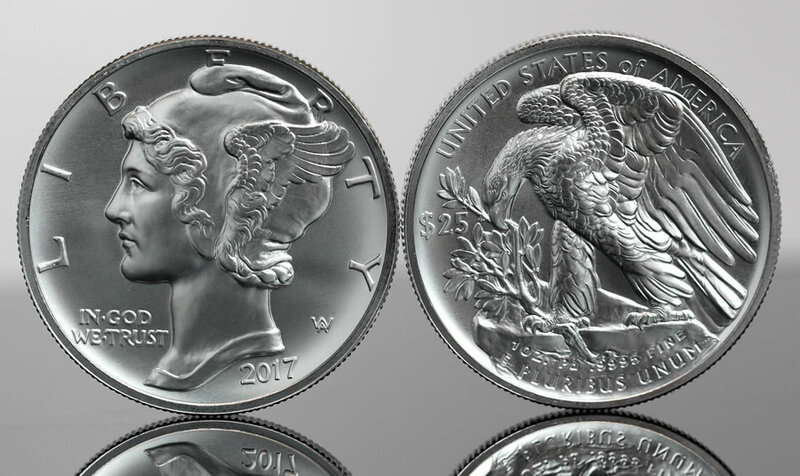 These same designs appear on the 2018 proof Palladium Eagle struck for collectors. It’s obverse (heads) offers a high-relief likeness of Adolph Weinman’s "Winged Liberty" design that first appeared on obverses of 1916 Mercury dimes. Inscriptions around the design read: "LIBERTY," "IN GOD WE TRUST," "2018," the West Point Mint’s "W" mintmark, and Weinman’s initials. The reverse (tails) features a high-relief version of Weinman’s 1907 American Institute of Architects (AIA) gold medal reverse, showing an eagle and a branch. Reverse inscriptions include "UNITED STATES of AMERICA," "$25," "1 OZ. Pd (the chemical symbol for Palladium) .9995 FINE," and "E PLURIBUS UNUM." 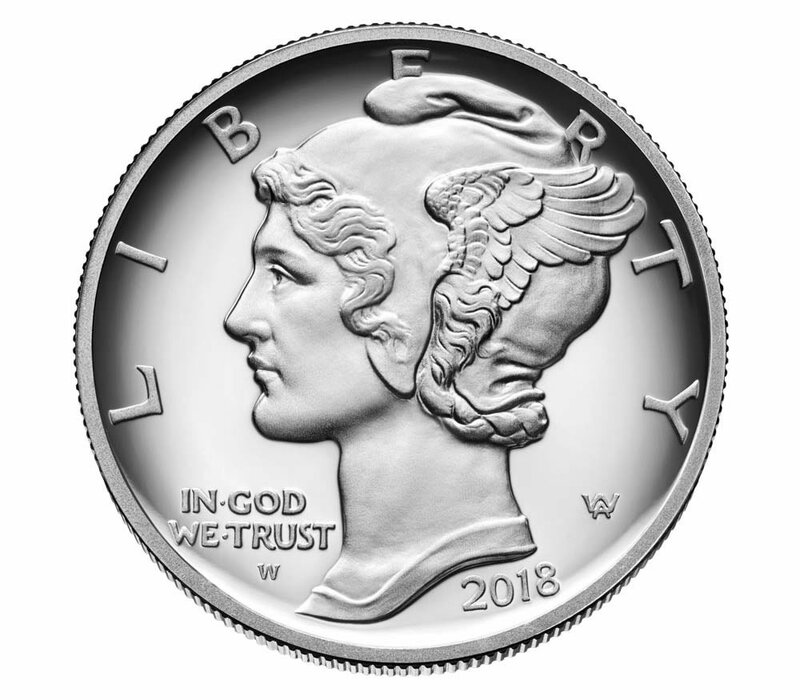 Order the 2018-W $25 Proof American Palladium Eagle from this U.S. Mint product page or by calling 1-800-USA-MINT (872-6468). The Mint has limited orders to one coin per household across all sales channels for the first 24 hours of sales. Update (Sept. 7 at 9:55 a.m. ET): First-day sales reached 14,782 coins according to the U.S. Mint. The coin lasted less than five minutes from its release before becoming unavailable. With this coin it’s like everyone around the dinner table banging forks and knives ready to gobble it up. I love Gold and will stick with it! So much hype on this coin to make a ridiculous profit. Not what coin collecting is about. I’m really torn on this one – love the design but thinking Palladium will settle way down like platinum … and $400+ over spot?.?? Nice coin, but 2 much it’s going down, would rather spend the $ on a nice gold coin or some silver right now. Flippers will be flipping out on this one. Let the games begin!! Got mine at 9:01 am PDT! I Just ordered 1 took less than a minute with my credit card information already on my account. I bought the bullion graded MS70 from Apmex. What I don’t understand the the population report because it says there is over 100 in better grade? I find it unusual the mintage is the same for both but otherwise I’m excited about this coin regardless if value goes up. It’s for my personal enjoyment. It should be PF70, not MS70. Got mine 11:03 CT! Fast ordering. Surprised! Yes, I read that some people were getting that notice 4 minutes past noon (EST)….I knew this coin was going to sell like hot cakes….but it even surpassed my expectations. out of stock within 5 minutes, managed to get 3 of them. some of the personal finance type blogs were pushing the PFS thing where people could get $1400 of credit card spend (to get points) and get $50 profit. how did you get 3? Different credit/debit cards & different addresses, probably. I only bought one of these, & I do see that they’re probably gone already. These are definitely beautiful coins worth buying from the Mint. Wow….3 coins! That is most impressive for the hottest coin the US Mint has produced in many years. jeffrey….seriously? $1,000 over COST, raw?? You were able to find a buyer at $2,300+? Wow! Since the coin went on sale, I have not checked eBay sold prices so to hear this, is most surprising being that I’d seen many of these coins listed pre-sale at between $1,800 and $1,900 on eBay prior to the time they went on sale by the US Mint. You made a serious profit. i got 5 but I wanted 7. this one went so quick. Thanks, because of you guys cheating I did not get one! There is a reason for the limit, sure it says household limit of one, but you and I both know they mean individual coin collector. I had a buyer already lined up to pay me $1600.00 cash for this beautiful coin, thanks for stealing it from me. I definitely agree with you. I personally have never sold a coin. If I had enough money I would have done the same as you. Besides currently unavailable and sold out are two different things. Danny still has a chance in my opinion. I was only going to sell it if it was the normal PF69 coin, my buyer knew this. There was no way I was letting him have a PF70 coin worth $5,000- $10,000 or a PF70 Cameo worth $10,000- $20,000 for just $1,600. I can still purchase one of these graded PF69 next year when palladium prices make a sharp temporary correction, so all is not lost, my buyer may still receive his coin. Mind blown! You’re pointing out that you couldn’t flip this coin because another flipper flipped it before you got a chance?. Is this for real? Wouldn’t you be stealing from the buyer that you have lined up? You were going to let that coin go for $1600.00? WTH, sold my first one on eBay for $2700.00. People are so desparate they will pay anything. I like how you’re so honorable that you were going to charge your friend a few hundred dollars for a coin you’d rather not have. You win if it’s a PF69 and you win if it’s PF70. Sounds like you’re stealing from your friend. Maybe GOD wasn’t in agreement on such a display of fairness. Not one dime charged indeed. I believe there’s 2,000 in $200. You really make yourself look foolish, continuing this thread, telling others they are bad for effectively doing what you failed to do. Throwing god into it makes you look even more bitter. No worries. Your original emails weren’t representative of the situation. I was on early and got blanked. The site froze up and kept saying try in a few seconds or call customer service. It’s a joke when you can’t order one of an item to collect because everyone is ordering multiples. Possibly many hundreds (if not more) people experienced the same thing you did. This was the craziest buyng frenzy the US Mint has ever experienced I think. Another Mint fiasco. Gone in less than 10 minutes with a 1 limit per order. This stinks! They were gone in just four minutes. The US Mint needs to limit the credit card and the computer address. They also need to spread out the sales through out the day, say a block of 1,000 at the top of every hour for fifteen hours in a row, so that people working days have an opportunity to order. Oh well, it’s just hard money, but it still hurts. I am very happy for everybody that did manage to purchase one of these first ever palladium proof masterpieces, enjoy! If you luck out and receive a PF70 Cameo, I hope it goes to $20,000. If the mint really wanted it to only go to ‘real collectors’ then they could do something like only allow people who have purchased more than 10 different items to buy the coin. The problem is that if you only have 15000 coins, and more than 15000 people want to get one, no matter how you spread it out, people are going to lose out. Yes, I heard the same thing from a couple of people, Danny….4 minutes past 12 noon EST and the coin was unavailable. It was a buying frenzy of the craziest kind I’ve ever seen. Actually, I know of a couple of people who were getting product not available messages at around 4 minutes past 12 noon EST…..this was a crazy buying frenzy for sure….lots of unfortunate collectors who were unable to buy direct from the US Mint now have to go to the secondary market. So.. I ordered and got no acknowledgement screen on the web. However, I did receive an email acknowledgment at 12:04:57. Order number is USM060291**. Omitting the last two digits, this translates to between 6,029,100 and 6,029,200 orders since the beginning of Mint time. However Mint-Palladium Eagle time started today. Does anyone know what the Palladium order numbers started at? Hi Adam– Did you get an acknowledgement screen on the web? What time did you receive your order acknowledgement email? Yes I did. But my email came in at 10:25am MST. At that same time I got an email saying unable to process due to a fraud alert on my credit card. I called around 10:45 and the mint changed the card for me and said all is well now. I ordered a silver coin just before and the order number was just a few under USM06016000. I got my order in at 12:01PM, order number is USM060180xx; then I receive an email at 8:45PM informing me that it was shipped. Dave, I was on the order page 10 minutes before the palladium coin went on sale and refreshed the page as soon as the hour struck 12 noon and from that second forward, I was experiencing all sorts of problems with the US Mint ordering process including error messages constantly coming up until the point (a few minutes after 12 noon) the coin was sold out and I got no acknowledgement screen that the order I tried to place went through. Then like 2 hours later I noticed an email from the US Mint notifying me that my order was processing! Hallelujah! was my response to seeing that email. I don’t know what the order numbers were standing before the APallE went on sale. Hey Jeffry. It is possible the mint will resume sales. It just says temporarily unavailable. Not sold out. Especially if there are order cancellations or returns. I understand the mintage is capped at 15,000. But its possible they only manufactured say 10,000 and make up to an additional 5,000 coins. I have been collecting coins almost 10 years and have seen this happen multiple times. It’s easier for the mint to manufacture more up to the maximun mintage limit than to have to scrap them if sales don’t meet expectations. I never meant they would increase the mintage past 15,000. They already processed my card also. Which means some are already ready to ship. I suppose anything is possible, I guess we should check back on their site in a day or two or maybe even tonight. This is a very unique coin, first off most people do not buy Palladium as an investment. This is my first purchase of this metal. By limiting the mintage they create hype and people visit their site and they collect email address’s. I would tend to believe that not all 15k were sold online. I think that places like APMEX gets some directly because of their relationship and business with the US Mint. Perhaps this is the Mints way of sparking interest in this metal to add to their sales? I really don’t know. If there are any that are not sold yet I am sure that there is a waiting list a mile long from all the private mints throughout the US and world. Hi folks. I was lucky to be able to purchase this coin today. I am relatively new to collecting. How does one go about getting a coin graded and how much does it cost? Thanks. Alfred you can do 1 of three things. Sign up with either PCGS or NGC and become a member and submit the coin yourself for grading. Don’t use any other grading companies, or find a reputable coin dealer in your area who is a member of either and submit through them. Good luck, hope you get a PF70. Cost varies. What about the different grading holders that the companies offer? Does it matter? I’ve gotten coins graded before, but not of this value. They give you a choice of labels some cost more than others. Generally speaking people don’t buy the holders, they buy the coin inside. Answered this for you in my post above. Only NGC and PCGS are accepted widely by the collector community. My personal favorite is NGC. There is a fee to join (for one year) and then a fee to submit (online) with mailing, shipping and insurance included in the fee. Good luck! per Dave Harper blog from Numismatic News this morning… Offers to sell or to auction the new coins appeared immediately on eBay. This morning you can buy the coin for $1,999 in a government package. If you want top graded coins, you have a choice. For $3,995 you can acquire a Professional Coin Grading Service PR 70 First Strike with a special label autographed by Thomas Cleveland, U.S. Mint AIP master designer. Priced at $3,499.99 was a Numismatic Guaranty Corporation PR70 Ultra Cameo First Release. How are there coins already graded on ebay? Am I missing something? Graded coins are not on eBay…yet. start with the sentence…If you want top graded coins…..and then the two options for getting a graded coin. they aren’t available till later this month. Pricey… whew! NWRobert , the companies selling graded coins pre-sale are anticipating they will be able to get a certain number of coins graded at 69 and 70. If it turns out they were wrong, they just cancel the orders they couldn’t fulfill. But they have been doing this long enough to have a pretty good idea of approximately how many coins they can secure at those 2 grades. The pictures they use for pre-sale are mock-ups….not actual photos. I missed out on this one again this year. It was a hard pill to swallow. Next year, I will be taking the day off of work. I am happy for those of you that who were able to get them. Next year, I will be joining that club. I am sure the third try will be the charm! Best of luck next year fellows! I think a lot of people were caught off guard with this coin since there wasn’t all that much of a buzz about it prior to sale time. I’m not saying there was no mention of it in the usual places, just that compared to many other coin releases in previous years, the buzz was very muted for this coin. I suppose it’s possible that this was intentional from those businesses and individuals who had every intention of buying one or more and liquidating it into the secondary market soon afterward. There really was a crazy buying frenzy for this coin. 15,000 mintage is quite high for a coin nowadays. Last years Boys Town uncirculated gold coin only had a mintage of around 2900. Good coins to make a quick profit. I started buying palladium when it was less than $200 an oz. I quit buying it a while ago and sold what I had. I guess I was about 15 years too early. Now everyone seems to be enthralled by it. Platinum is probably the better deal for long term. I remember when people were paying $5000 for the first year ATB bullion coins. Those people are probably asking themselves why now. The crazy people that are paying high prices for this one on Ebay will probably regret it someday. Coin collecting is a dying hobby as seen by lower and lower mintages of commemoratives each year. Myself, I generally stay away from the hype of stuff. Very few people are interested in the Boys Town coin….and I don’t blame them….it’s largely an unappealing design. On the other hand, the Amer. Pall Eagle is a coin that virtually everyone who has seen the mock up US Mint illustrations of it loves the design. Crap design vs very appealing design…..makes a huge difference in direct and secondary market sales. This is a copy of an earlier design. They did a 1/10th oz gold of it already. I’ll take rarity over design myself. There are a lot of them for sale right now. I think this coin has peaked already after 1 day. Downhill from here in my opinion. I think they sold out so fast because alot of people bought them to sell. The people to blame for this mess are those collectors who are too lazy or dumb or have too much money to burn to go to the mints website and pay $1400 for the coin. Anyone who passes on the OGP and pays over $3000 for a meaningless PF70 first day of issue label is a fool who’s heirs will be the ones to figure out what a fraud grading current mint product is. Very perceptive Andrew! Almost all recent years U.S. Mint products grade at 69 or 70. Getting a 68 & below is very rare from any grading service. More than 95% of last year’s Palladium AE bullion version coins got a 69 or 70 grade at PCGS for example. Palladium was $50 an oz after hitting $1000 an oz in 1999. It’s rarity hasn’t changed the whole time. It’s an industrial metal. Palladium and platinum are interchangable in catalytic converters. Platinum used to be twice the cost of palladium and palladium used to be half the cost of gold between 2004 and 2008. What happens with this coin when palladium drops in price? 3/4 of palladium and 1/3 of platinum production go to catalytic converters. So both metal prices are driven by car production, and since palladium is much more dominated by catalytic converter use, its price is not be likely to exceed platinum by too much. I’m pretty sure that the law says that these coins must be minted with palladium mined within the United States. US palladium production is 12.5 metric tons per year. there are about 32000 troy ounces in a metric ton, so this one release of 15000 coins uses about half a metric ton, which would be 4% of the entire annual US palladium production. These coins become more & more intriguing each & every time I hear or read about them. I have two 2017’s & one 2018. I’m definitely saving money now for a 2019 release. Was going to keep the one I got but decided to flip it given the premium its bringing. Sold as unopened – didn’t last 20 minutes on flea bay. Wish they had issued more for the many that wanted one. Did anyone notice that more were released today?? Closed out very quickly – AGAIN!!!! It’s an absolutely fabulous design, not so sure about palladium, I’m suspicious. Why is it so valuable? Jewelry, industry, or what? When there’s a monetary standard based on physicals it’s always been gold/silver. What kinks me is the US Mint, supposedly working on behalf of citizens, would sell this at a ridiculous amount over spot, in such small numbers. A scarcity market is one thing, baked up by your own government is another. That’s not really the history, but more so lately, it’s not a good trend. The economics, long term, seems flaky to me. I was lucky enough to successfully make my purchase immediately after they went on sale by the US Mint at 12:00 Noon on September 6. I was actually traveling by car that day and stoped at a Sheets on my way to North Carolina from New Jersey at 11:30 AM so that I could ramp up my laptop and get ready for the purchase. Used a WiFi connection and had no problem making the purchase as soon as they became available. Subsequently, I submitted this beautiful Palladium coin to NGC for grading and was just today pleasantly surprised to learn that it graded PF70. So happy I was able to add this unique 2018 Palladium Proof coin to my collection, and with an NGC PF70 grade. It does not get better than that!